Each box contains evidence, clues and notes about a crime that has been committed. Follow the evidence to unmask the criminal and their motives. Do you have what it takes to solve the murder mystery? Each new quarter brings a new case to your door. The box itself, is a self contained mystery. This means that everything you need to solve the mystery is contained within the box. You don't have to go online to obtain clues. It all comes down to an adventurer like yourself and the box. Contained within this mysterious box you receive an object summarizing a crime that has been committed. This summary could be in the form of a journal, a case file, a personal log, diary, or some other similar item. Additionally, you will be provided with evidence and clues that have been obtained. At specific points of the adventure, you will be prompted to open the clues and review the evidence. Who is the box suitable for? 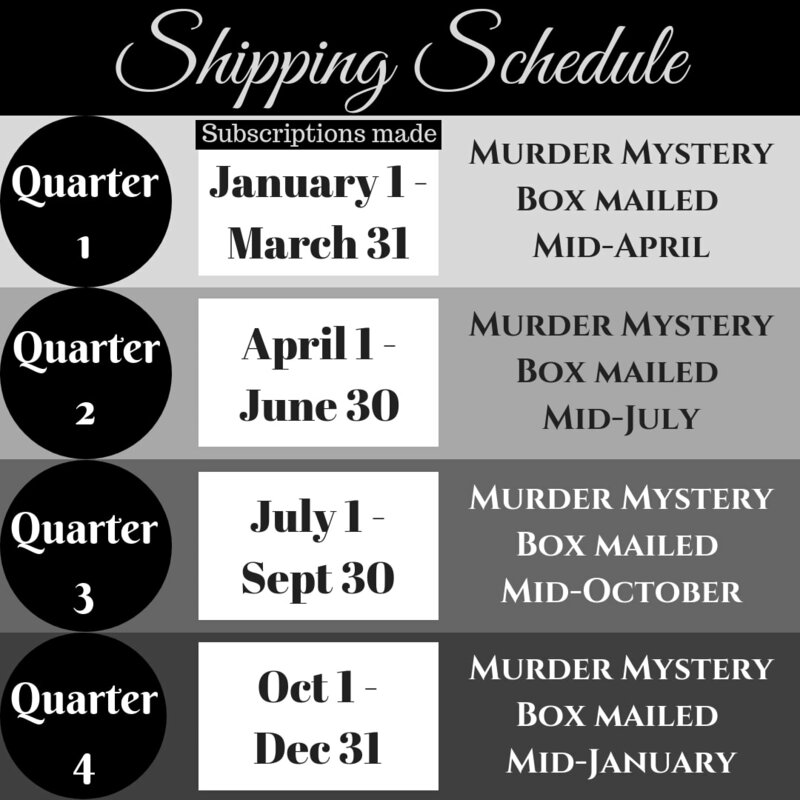 The box contains adult themes, meaning, murder. The box is not recommended for children for this reason. ​When will I be billed? You will be billed at the time of subscription and every three months thereafter. You can cancel at anytime. Please note that we do not offer refunds. Plan accordingly. If you cancel, but you have already been charged for your next box, you will receive it as scheduled. No other boxes will arrive after that and you will not be charged again. ​You can begin your subscription again at anytime. How long will the adventure take? It all depends on the adventurer. It's like asking how long will it take to beat a video game or read a book. A rough estimation would be an hour or two if the adventurer really dove into it to finish it all at once. We recommend going though the box at your own pace. It's not a race. It's a mystery to solve. How do I make a gift subscription? Some elements in the box may be personally addressed. When ordering a gift, we want the name of the person who will be receiving the box. ​During the check out process, be sure to select the "Shipping Address" as different from the billing address. This will allow you to enter the first and last name of the recipient and their address. **Note: Even if their address is the same as the billing address, select this option & enter the same address. This way, any personalized materials will have the correct name of the recipient on them. Can I share my box on social media? You are welcome to share your unboxing and experience on social media. Please do not share spoilers, elsewise you may spoil the adventure for others. Please do keep in mind that everything contained within the box is copyright protected. While you are encouraged share your experience, we must insist that it is in review format and not a "walk through" of the experience. No part of the box or its contents may be reproduced, distributed, or transmitted in any form or by any means, including photocopying, recording, or other electronic or mechanical methods, without the prior written permission of the publisher, except in the case of brief quotations embodied in critical reviews and certain other noncommercial uses permitted by copyright law. Please note that we do not offer refunds. Plan accordingly. If decide to cancel, but you have already been charged for your next box, you will receive it as scheduled. No other boxes will arrive after that and you will not be charged again. ​You can begin your subscription again at anytime. ​Curious about the cards hanging about on the site? They're part of our Mysterious Cards game. Intrigued? It's a mini mystery game you can play on our site at no charge. Stop by the home page and click on the Mysterious Cards tile for more information. Send them our way. We would love to hear from you.